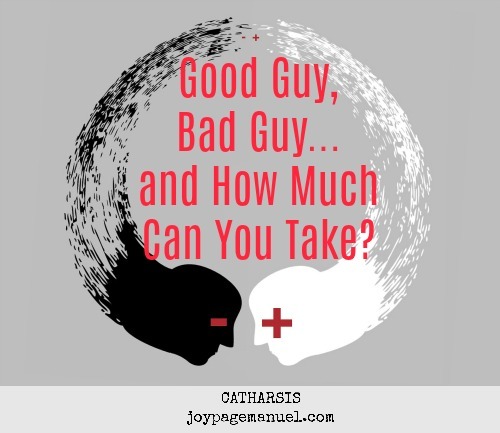 CATHARSIS: Good Guy, Bad Guy...and How Much Can You Take? "Optimus Prime is now a bad guy in this upcoming movie??" It was a sincerely puzzled question from me to my ten-year-old after seeing the trailer for the latest Transformers movie. From what I'd seen, Prime was attacking humanity and so I assumed my son would answer in the affirmative. Instead he said, "Well, no. It's just that he was overpowered by dark energon. "(FYI: the fuel or energy source of the Transformers race). I found his response fascinating, which made me ponder the question of what constitutes 'being a bad person', which, if one really gets to the bottom of it, points to one's moral identity. My assumption that Prime is now a 'bad guy' stems from what I saw in terms of his actions. He was attacking innocent humans and was out to destroy Earth, therefore making him bad. For my son, however, Prime's actions don't necessarily make him a villain because he's 'not himself' and appears to have no choice given that he was 'injected with dark energy'. Moreover, my son argues that 'Prime isn't bad because he doesn't intend to be'. The principle behind my belief is obviously that we are what we do; that behaviors, being external and observable realities, define who we are. For my son, it's not so much the behavior but rather the intentions. If one does bad things but he didn't really intend to, then that person can't be defined as 'bad'. The more I think about our difference in beliefs, the more I realize the complexity and merit behind both camps. I can't simply label my son's thought process as naive and inaccurate. Behaviors are important, but so are intentions. The trouble is, intentions are intangible and there are often complex processes and intermediate variables that stand between intention and behavior. As such, we define those around us based on how they behave towards us, how they treat people, how they navigate social situations. If you're a 'black and white' sort of person, then yes, this would be simple and you can categorize people based solely on what they do and how they relate to you. Defining who to avoid or sever ties with is pretty straightforward. But for some who thrive in 'grays', such things don't easily translate. Benefit of the doubt is always considered. Motivations, intentions, state of mind, star alignments, hormones, pollen count and everything else worth factoring in will be factored in. Letting go of anyone will always be a challenge. I've been both at different points in my life. I've been black and white, but admittedly mostly gray. I've had people hurt me repeatedly, and some of them I've chosen to let go of, while some I've repeatedly taken back and chosen over and over to be a part of my life. For me, the decision has always hinged on two things: (1) history ; and (2) my so-called 'oxygen levels'. Deciding that someone is 'bad' really translates to when someone is 'bad for me' and deserves no space in my life. The decision as to whether or not a relationship with this person is worth pursuing has to do with the past we share, whether or not that person has added value to my life with the experiences we've lived, and whether or not continuing a relationship with the person is still healthy for me. If continued exposure to this person—to the 'bad' he/she exhibits—damages me, my sense of worth, my peace of mind, sanity, and all that is positive and necessary to my well-being, then it is not worth choosing the relationship over my Self. If the 'bad' steals the good in you, then what good would be left for you to continue giving? The oxygen mask has to go on you first. To my ten-year-old, Prime can't be bad because he has always known him to be good. My son is relying on history, on track record, for his assessment of Prime's moral identity. In addition, he is able to justify Prime's destructive behavior based on his absence of free will; that Prime doesn't intend to be hurtful and bad but just can't help himself because of the dark energon within him. I, on the other hand, can more easily shrug my shoulders and walk away with the conclusion that Prime has become dark. Clearly, between me and my son, it is he who has a past and a deeper relationship with the Transformers. It would be simpler to see it all (people and situations) in black/white wouldn't it? That's why it's so tempting!